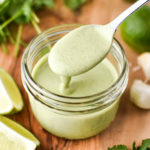 Fresh cilantro, tahini and lime juice are the stars of this creamy Cilantro Lime Tahini Dressing. It’s paleo, gluten free, and vegan, plus it works great as a make-ahead dressing! Add all ingredients to a blender or food processor and blend for about 20 seconds, until well blended. Store in an airtight container and enjoy within 4 days!